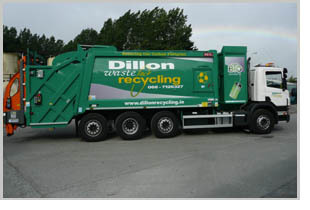 At Dillon Waste, we offer our customers customised waste management solutions. Our Sales Representative will meet with each customer to discuss their individual needs and advise them on the most efficient and cost effective waste collection service. 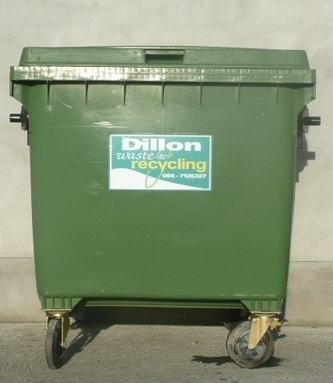 We offer our customers a range of bin sizes that include 140ltr, 240ltr, 360ltr, 660ltr and 1100ltr bins. We also provide compactors & skips for hire. As part of our commercial customer service, we collect General Residual Waste, Dry Recyclables, Food Waste, Cardboard and Glass. This list is not inclusive of all materials collected by us. Our Sales Representative can discuss in detail the full range of services that we offer. We continually monitor our processes and procedures to ensure we provide the most efficient service. We are always looking at new ways to help the environment and reducing our carbon footprint. In 2011, we purchased a new 3-Compartment Wheelie Bin truck in order to provide an efficient and cost reducing service to our commercial customers for kerbside collections. This was the first purchase for this type of vehicle in Ireland. This purchase enabled us to encourage our customers to avail of the 3-bin service (Residual, Recycling, and Compost) resulting in reduced costs to our customers and increasing the diversion of residual and biodegradable waste from landfill. Please contact us on 066 7126327 to arrange a meeting with our Sales Representative.